Neil Armstrong aimed for the skies from an early age. A toy plane from the Moonwalker's childhood is coming to Heritage Auctions' April 18 Space Exploration Signature Auction in Dallas. The plane is one of the more modestly priced lots in the sale, estimated at $1,500-2,500. At the top end of the auction is the last Apollo 15 flown Robbins medal, which could see bids in excess of $30,000. The plane was found after Armstrong's parents moved from their home in Wapakoneta, Ohio in 1964. 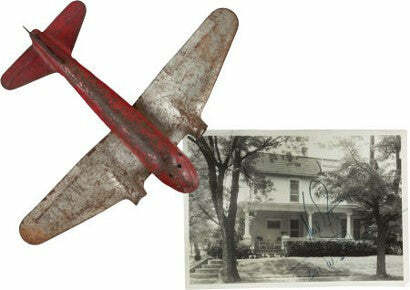 The house was sold to the Miller family, who then discovered items in the attic, such as Neil's school work and this red metal toy plane. The toy has been authenticated by a letter from Jacqueline Miller, who knew Mr and Mrs Armstrong personally and whose parents originally bought the house from them. Within the letter, she states that Neil's mother told her that the plane was in fact Neil's, and that her family also found a red wagon in the attic, which they donated to a local museum. The toy is accompanied in the sale by a Neil Armstrong signed photograph of the house as well as a copy of the warranty deed regarding the purchase of the home. Our extraordinary collection of space memorabilia includes some very special items for collectors, including a complete set of signed photos from every Moonwalker, and the unique and infamous scissors and comb used by Neil Armstrong's hairdresser.